Thanks to Charged Kuwait which brought the Italian electric motorcycles here in the Middle East as the sole distributor. The Custom Show Emirates continued wowed us once again this year. It was a successful event where we witnessed a plethora of motorcycles. Each one of them was special in its own way. However, it was the electric motorcycle from Energica that really got us excited. 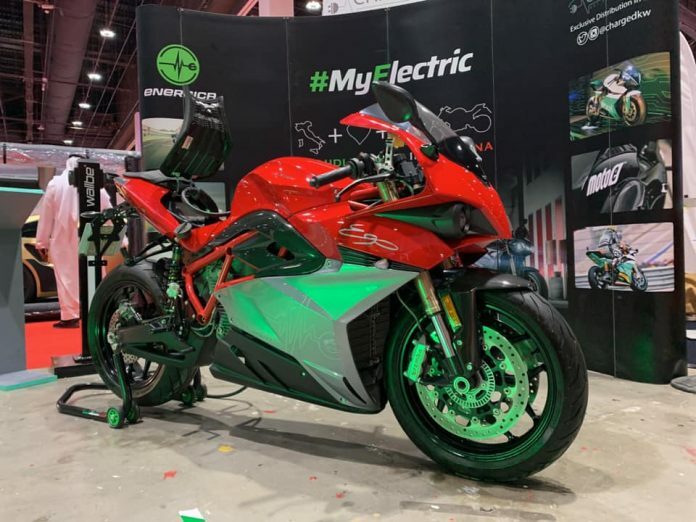 Energica Motor Company S.p.A. is the first Italian manufacturer of supersport electric motorcycles. Thanks to Charged Kuwait which brought the Italian electric motorcycles here in the Middle East as the sole distributor. Energica has got three models available – Eva, Ego, and EsseEsse9. It was the Ego which was put up on display at the Custom Emirates Show 2019. The Ego comes with a 13.4 kWh battery pack and its electric motor generates around 145 HP and 200 Nm. Since it’s an electric motorcycle, all the Newton-metres are available instantly. The Ego has a top speed of 240 km/h. Energica says that it takes 20 mins to charge the batteries up to 85% when plugged into a DC fast charger. There are 4 riding modes – Eco, Standard, Wet, Sport – which would help you keep ‘your Ego’ in control. There are 6 levels of traction control system combined with the existing eABS and the Bosch ABS. There is also cruise control. One of the most attractive features of the Energica Ego is its 4.3-inch TFT color display which shows tons of information. Energica is the sole supplier of all the race bikes for the MotoE world championship which will make its debut this year. Now, you can imagine how serious Energica is when it comes to electric motorcycles. As of now, there are no details regarding the Energica Ego price in the UAE but we are expecting it to be revealed pretty soon. We are also looking forward to having a test ride of the Ego and give our first impression of the e-bike at the earliest. Previous articleDakar 2020 in Saudi Arabia?